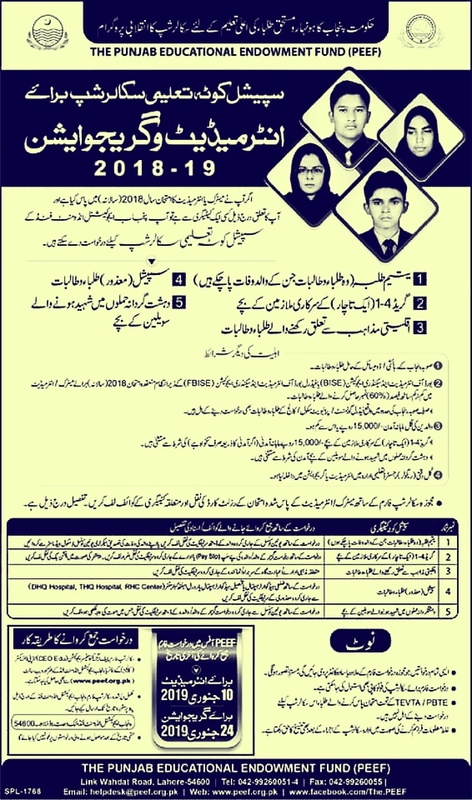 Punjab government announces Scholarships for Intermediate and Graduation students 2019 by PEEF.The Scholarship may apply for the student who has passed the Intermediate and graduation exam in 2018.In this scholarship, the student can apply that whose parents have died.In this scholarship, those students can also apply that is disabled.Punjab government announces the latest scholarships for academic education.Students who are grade-for-grade employees can also apply.I will provide you complete information about this scholarship and tell you how to apply PEEF Scholarship 2019.In this scholarship, you can complete your education completely. Government Punjab will pay all your expenses.Children of those martyred in terrorist attacks can also apply for this scholarship.Students belonging to minorities religion can also apply to this scholarship.This scholarship can apply all the students across Punjab. 1) You must have at least 60% of the Marks in Intermediate & Graduation to apply for this PEEF scholarship 2019. 3) Intermediate and Graduate Examination Have passed in the annual examination of 2018. How to Apply PEEF Scholarship 2019? This scholarship application can be obtained from the Office of the Chief Executive Education Office.Complete solved application forms send to the bottom of the address. and January 24, 2019 For Graduation.